Leading and organizing Cooking Matters courses are a significant portion of my Americorps service. 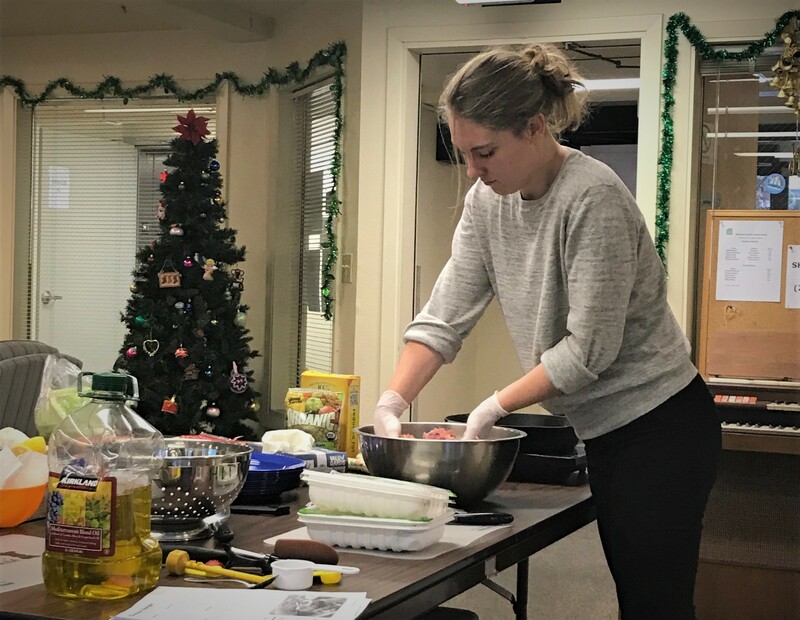 They are a great hands-on class that allows participants to practice what they are learning and integrate cooking skills, healthy eating behaviors, and budget friendly shopping techniques into their everyday lives. It is one of my favorite activities I do at HIP, and I love getting to meet new people from different walks of life. Every class is different, and everyone has a story to tell. We host classes in retirement homes, schools, community centers, and churches. Or most recent class was hosted at Literacy Source. Literacy Source provides free learner-centered English literacy or language education to low-income adults in the Seattle area. To help prepare and advertise for our new class, I hosted a Cooking Matters workshop as a fun, hands-on demo. The short Cooking Matters demo was organized as a short “taster” of what one could expect from a class. This included a short nutrition lesson and a very short cooking activity, all fit into a one-hour slot. A cooking course is a great opportunity for ESOL (English as a second or foreign language) students to practice speaking and reading in a non-classroom setting. And I was excited to participate. Leading activities with ESOL students was a large component of my work in the Peace Corps. I was a little rusty, out of practice, and ended up arriving and setting up the class way too early in my anticipation. But as students began to trickle in, any feelings of mild anxiety quickly dissipated. I like to start all my new classes with introductions. Just something to break the ice and create a relatable moment. Usually something about who you are, what your favorite food is, or why you are interested in cooking and nutrition. During our class introductions, one woman who was from Korea spoke softly, telling me that she was feeling very depressed. She had no motivation to cook or create meals for her or her family. She wanted to take this class to fix that. For someone who felt they were not motivated, she certainly did not show it. Throughout the class, she was very engaged. She showed interest by asking good questions about what the healthiest fats and oils were, wanted to help chop all the vegetables for the black bean and bell pepper salsa, and even volunteered to stay after to help me wash dishes and load my car. After I assured her that it was not necessary or expected, she insisted. When I was about to leave, she requested an extra copy of the recipe from the lesson. She wanted to save copies, because she “feels excited to make this again. I will make it for my family, and I want to do this more. I feel like I am getting my motivation back”. My story is not dramatic and it is not life changing. But it does reflect the empowerment that comes from something as simple as a one-hour cooking demo. By providing an opportunity to others to express themselves and try something new in a safe environment, we can help others create meaningful changes in their own lives. And that is ultimately what Americorps is all about to me. One person cannot save the world, but we can help others to empower themselves, and that is a necessary component of creating positive, meaningful, and sustainable change. I am looking forward to more moments like these, because while they may seem small to us, the impact on individuals, families, and communities is invaluable.